Holy smokes...there are only 33 days until Christmas. I realized this as I was looking at my calendar and realized I literally had to schedule in time to do some holiday shopping. I'm so excited for what's coming up! I have a few semi-local press trips lined up to round out 2014 and am working on some big things for 2015! As I'm typing this I'm also brainstorming about all of the DIY projects I want to take on to make my new apartment feel more like home. I've been scouring Pinterest and have even begun a few projects of my own...none are even close to being ready to share with you all, but once they are, I will! Promise! In the meantime - here are some of my faves from around the interwebs this week! On December 2nd, TO Tech Bash will be going down at The Courthouse. You can vote for your choice of TOTech Top Contributor HERE. I highly recommend Mr. Joallore Alon (aka @clickflickca) , I hear he's awesome. Next month, Notable will be hosting the Notable Awards recognizing young professionals from across the country. Montreal and Vancouver will have their own awards on different days, but the Toronto awards will be on December 4th. I'm so happy to see so many familiar faces in multiple categories for both Vancouver and Toronto! You can cast your votes HERE. On my to-do list is to downsize my clothing and reorganize my closet. So I've been addicted to Pinterest looking for some helpful DIY tips and tricks. The gorgeous @therealmiamazin brought back a 6-week sit-up challenge. 16 Things It's Ok To Not Have Figured Out By Your Thirties. HoHoTO in support of The Daily Bread Foodbank is coming up! Have you gotten your tickets? Are you interested in sponsoring? 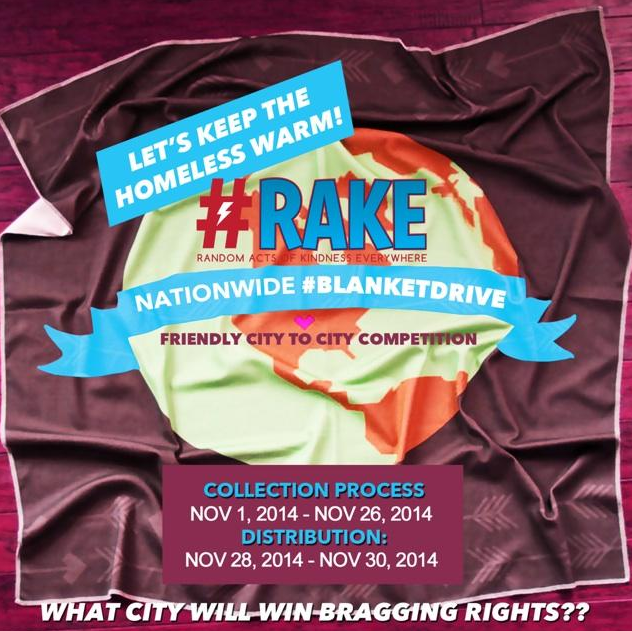 The #RAKE #BlanketDrive is still happening and Toronto is the only Canadian city participating. I've received blanket donations as well as funds through PayPal for the blanket drive. If you are able to contribute and donate - please let me know! If not, a simple retweet of THIS TWEET is greatly appreciated! You can also share on Facebook, Instagram, send a bird with a note attached to their foot - whatever you'd like! Any help is greatly appreciated by the #RAKE team and all those in need who we will be helping!